The best compliment you can give us is to tell your friends and family about your positive experience here at Grand Avenue Veterinary Hospital. We are always seeing new patients and would love the opportunity to care for the four-legged family members of those that you love. For those that come our way and give your name as their referral, we will show our appreciation to you with a tiered rewards program. What an easy way to earn goodies and discounts for you and your pet; and we could not think of a better way for you to pay us a compliment. 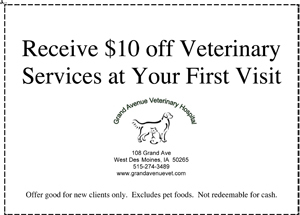 Send your friends and family to our website and they can also print off this coupon for $10 off veterinary services at their first visit. It's a win-win situation for everyone!